Saint Augustine (354-430) is one of the most influential thinkers of the Western World. His answers to life’s profound questions shaped Western civilization to an unparalleled degree. How did the Middle Ages come to know this great Father of the Church? How did his large oeuvre survive the nearly sixteen centuries since his death? This is the eleventh in a series that looks over the shoulder of medieval readers to discover how they shaped Augustine’s legacy, and created an image of the man that has endured to our times. So far, this series has focused on Augustine’s writings and how they made it through the Middle Ages, largely intact, though far from unscathed. Of course, his words are not all that remains of the great Bishop of Hippo. Today we will look at the relics of St. Augustine and the tug-of-war that broke out over them in the fourteenth century. In 1327, Pope John XXII issued the papal bull Veneranda sanctorum, in which he granted special privileges to the Hermits of St. Augustine, a religious order that was founded in the 1250’s by bringing together a number of Tuscan hermetic orders who adhered to the Rule of St. Augustine. 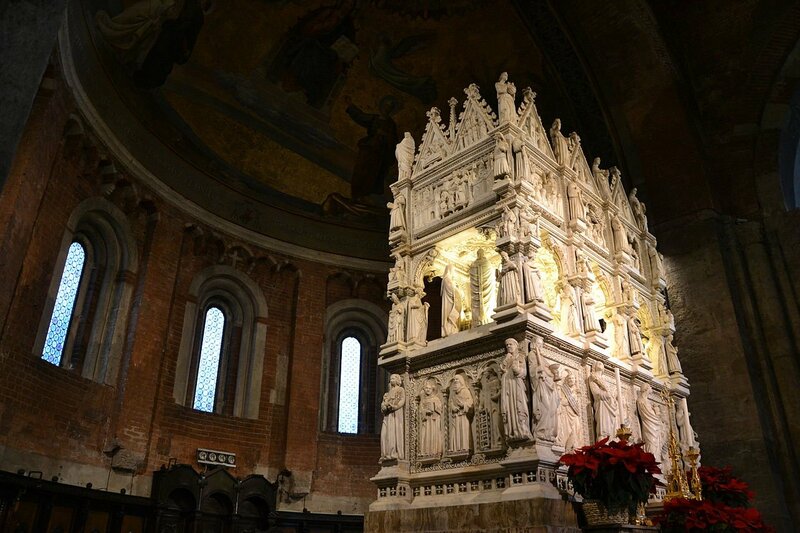 Specifically, the Hermits were given joint custody, together with the Canons Regular of St. Augustine (another Augustinian religious order) of the bones of St. Augustine, which were kept in the basilica of San Pietro in Ciel d’Oro in Pavia. The Hermits were given permission to build a monastery next to the basilica and to share church services with the Augustinian Canons, who up until then had been solely responsible for the preservation and veneration of Augustine’s remains. The pope’s decision did not go over well with the Canons. Custody over the bones of a Saint was a prestigious assignment, not to mention a highly lucrative one. Pilgrims came to pay their respects and pray for miracles, which, if they occurred, could result in generous donations from grateful churchgoers. The Canons suddenly saw their revenue cut in half and their authority under attack. To add insult to injury, until the new monastery was complete, the Canons had to share their living quarters with the uppity Hermits, who claimed a closer bond with Augustine. The resulting argument wasn’t pretty. So, who were the Hermits exactly and what claim did they have on Augustine? According to the early legends of the Order, Augustine traveled to Tuscany after his baptism and the death of his mother Monica in 387, before returning to Africa. He lived with a hermit community in Tuscany, either at Lecceto or Centocelle, and taught them his monastic Rule. Other stories say that Augustine founded a hermitage in the woods outside Hippo and even that he died there. There are quite a few problems with these claims. The timing doesn’t work, for one, and both Augustine in his Confessions and Possidius in his biography of Augustine omit any reference to Augustine’s visiting and/or founding hermit communities in Tuscany or outside Hippo. Augustine states that he traveled only between Ostia and Rome after his mother’s passing and Possidius recounts Augustine’s death in the city of Hippo, during the Vandal siege. Still, the Hermits were adamant about their close association with Augustine and promoted his cult with great fervor. After the ‘Great Union’ of 1256, which welded the different eremitical groups together into one Order of the Hermits of St. Augustine, their numbers grew rapidly all over Europe. Many famous medieval intellectuals and theologians came from the Order, which helps explain their growing influence. Since the thirteenth century the sacristan of the Papal Palace, who among others has the right to administer the last sacraments to the Pope, is always a member of the Hermits of St. Augustine. Unlike other saints, there are few great or dramatic stories associated with Augustine’s relics. His remains had been in Pavia, Italy since ca. 720. They came to the city from Sardinia, where they had been since shortly after Augustine’s death. The transfer from Sardinia to Pavia was instigated by Luitprand, king of the Lombards, who took the initiative when he heard that Sardinia was in danger of being overrun by Muslims. In the basilica of ‘Saint Peter in the Heavens of Gold’, so called because the dome of the church was covered in gold, Augustine’s relics rest alongside those of Boethius (477-524), author of the Consolation of Philosophy. In 1842 some of Augustine’s arm bones were transferred to Annaba, Algeria, the current location of ancient Hippo, where they are kept now in the Basilica of Saint Augustine. Back to 1327, so what happened next? The Pope’s directive that the Augustinian Canons and Hermits had to ‘share’ Augustine’s bones raised a number of practical concerns. From ‘who had the right to say mass on Augustine’s feast day, 28 August’, over ‘who could walk first in processions’, to ‘who had to use which door to enter the church’, the issues arising from the pope’s unfortunate decision quickly escalated into a full-blown row. Just one month after the bull was issued, there was a showdown in the basilica, with the Canons demanding that the Hermits produce an official copy of the papal letter supporting their claims. Despite attempts to sort out these practical issues – attempts which involved interventions from the Pope, the emperor and King John of Bohemia, who ruled Pavia at the time – the feud was not laid to rest. By 1400 the best solution they could find was to build a wall dividing the church in Pavia in half. Of course, each Order claimed that the bones of Augustine resided in their half, no doubt a confusing situation for visiting pilgrims. Soon, the central issue became which Order truly had the right to call themselves ‘Augustinian’. A great number of treatises, pamphlets, sermons was created to support the warring sides’ claims. Gradually what started it all, Augustine’s bones, withdrew to the background. Until 1695, that is, when masons discovered a marble box under the floor of a crypt in the major chapel of the basilica. Allegedly the box carried markings in charcoal spelling out Augustine’s name. When the workmen discovered the box to contain parts of a skeleton, they closed it back up and called the sacristan for the Augustinian Hermits to the scene. He could not proceed with examining the find for another five days, however, because the abbot for the Augustinian Canons was away from the city. Even then, over 350 years after the original conflict, the question of who held the rights over Augustine’s bones remained a very delicate one. We will stay with the Hermits of St. Augustine a little longer still. Their study and veneration of Augustine resulted in great intellectual and artistic achievements and, incidentally, in a forgery that would become one of “Augustine’s” most popular works. Eric L. Saak, Creating Augustine. Interpreting Augustine and Augustinianism in the Later Middle Ages, Oxford: Oxford University Press, 2012.